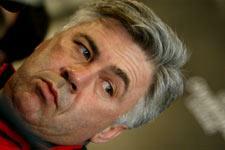 The Italians press conference took place at 14 :30 at Milanello with coach Carlo Ancelotti and striker Andrei Shevchenko. 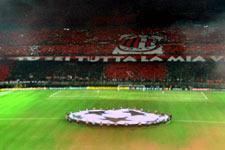 Milan must win, OL no, does that change anything? We’re used to playing in these types of matches. Yes, we have to win. Our goal is also to win this entire competition. This type of match is played without too much second-guessing. 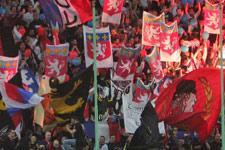 Our supporters will help us. Will the physical impact be a key to the outcome? Certainly. The two teams are at the same level because the main players were all rested at the weekend. On the right, either Stam or Costacurta will start. It annoyed me a little bit but it was in the league. Tomorrow is a different story because it’s the Champions League. Does OL play the same home and away? Obviously, it’s the same team. They have a very characteristic identity. What do you think about the return of Juninho? He is a very dangerous player. He is very, very good, with lots of personality and quality…but he is not the only player in this team. OL has very good players and there won’t be any anti-Juninho plan. Grégory Coupet was decisive in the first game and might be again tomorrow. It’s up to us to cause him problems. Are you worried that your team hasn’t scored for two games in a row now? We can count on a strong and powerful attack, even if it’s true i twas a shame not to score in the first game with all our chances. Scoring goals isn’t exactly new for us – generally we know how to do that. Milan is not playing for its season tomorrow, I hope. 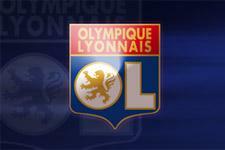 Do you think OL will change their formation for the return match? I don’t think Gérard Houllier will change his formation, even in attack. Will Maldini start against OL? He is available. He has recovered well. All the players could play in this match. I knew he was good. He found good solutions and good postitions to stop us scoring in the first leg. Especially my two efforts he saved with his legs. Are you aiming to beat Van Nistelrooy’s record of 12 goals in a single Champions League season (Sheva has 11 goals so far this season)? I’m aiming to win on Tuesday above all. This is a team sport. If I score it’s a bonus for me. We, the attackers, are not worried, even if we haven’t scored in two games. Bad luck won’t be on our side forever. Will your approach to this match be different? No, this isn’t a final. It’s obviously not just another match either, it’s a match a little more important than usual.